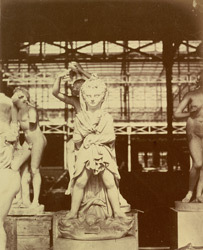 Statue of Puck by Northumbrian sculptor John Lough (1798-1876), on display at the Renaissance Court of the Crystal Palace exhibition hall in Sydenham. Designed by Joseph Paxton to house the Great Exhibition of 1851 in Hyde Park, the Crystal Palace was later reconstructed and enlarged in Sydenham, south London. The first column was raised on 5 August 1852 and the palace was opened by Queen Victoria on 10 June 1854. It housed a showcase of the century's technological achievements and featured halls depicting the history of art and architecture from around the world.